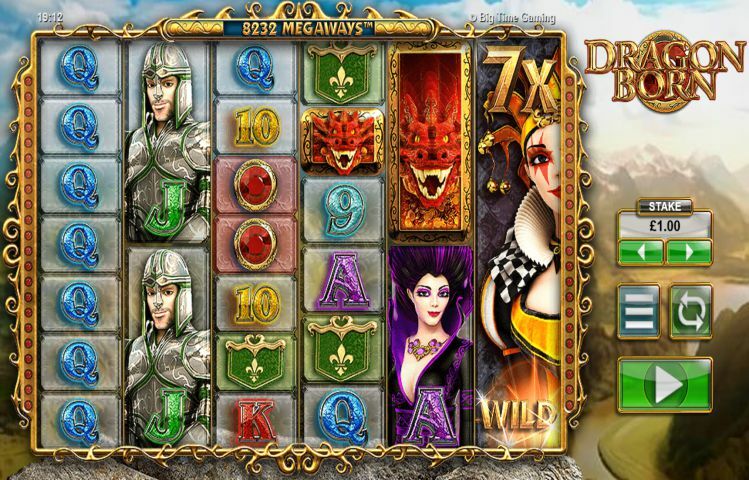 Dragon Born is the engaging new online slot machine that offers greater chances to win. Dragon Born is a traditional 6 reel slot machine, offering payouts when players get matching symbols on left to right adjacent tiles. However the games trademarked Megaways system alters the playing field quite a bit. This feature changes the configurations of the tiles to offer 117649 ways to win while most slot games offer only 4096. This means Dragon Born offers nearly 3 times the earning potential of an average online slot game. While there are only a set number of symbols, tiles come in a wide variety of size configurations giving greater chances for matching configurations. Each of the six reels offers a different number of symbols and users can win by getting a large set of small symbols all stacked together or by getting that big tile in just the right spot to connect two smaller groups, winning a payout that reaches all the way across the screen. The base game design is simple and uses a fantasy theme for flare. The graphics are high quality and show off unique characters and symbols. These symbols evoke standard playing card suites. There are Kings, Queens, Jacks, Tens, and Nines as well as more unique symbols. The titular dragon offers the largest payout available and after that you have the purple Witch, the green Fleur-De-Lis banner, red and blue Jewels, and a Jester to serve as the Wild Card. The Diamond symbol gives a chance to trigger the scatter effect and win a free spin. Each Diamond triggers an additional free spin offering unlimited earning potential. The graphics add spice without serving as a distraction from the actual gameplay. The background is a simple, peaceful view of a mountain valley. There are no moving pieces, background explosions or other visual clutter to get in the way of the game. The same goes for the music which is quiet and serene rather than loud or hectic. If players are looking for a visually dynamic slots game with great earning potential then they should seriously consider logging in and playing Dragon Born.